Hello there! 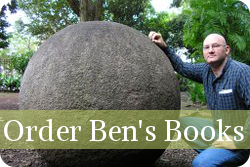 Welcome to the last of my ten-part introduction to the basics of scientific paranormal investigation, adapted from my book Scientific Paranormal Investigation: How to Solve Unexplained Mysteries, and the workshop I give of the same title. It’s intended to give the layperson a taste of how a science-based paranormal investigator goes about solving mysteries. Below are the two mini-mysteries I gave you in the previous part, followed by a series of hints to guide you along the way. The solutions to the mysteries are then presented. 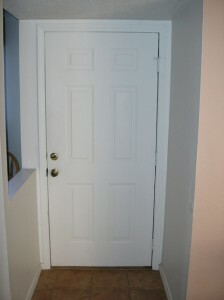 Mystery 1: The Haunted Door This is one of my favorite cases, because it happened to me in my own home. 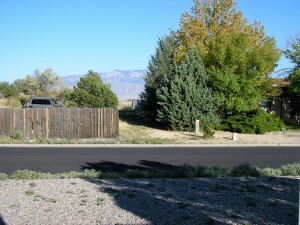 In July 2007 I moved into a three-bedroom home near Albuquerque, New Mexico. The house is located near a corner in a residential area at the top of a hill, with a small, grassy park kitty-corner to me which serves as a bus stop for local school kids. The front yard is mostly gravel (due to the desert climate) and the house is about thirty years old. The wood-frame, single-story house is well insulated, with a metal front door and double-paned windows. The city of Albuquerque lies to the southeast, across the Rio Grande river, flanked by the Sandia mountains. There are no known deaths or tragedies associated with the home. (Not relevant, but someone always asks!). On several occasions early in the mornings I heard a knocking on the front door. The knocking was not very loud, but noticeable and enough to roust me from my bedroom, which is on the opposite side of the house (facing the back yard). I’d walk across the tile floors, open the front door, but no one was there. I might see a car driving by, or the high school kids waiting by the corner, but no one was near the house. (I thought about being that cranky old man on the corner, yelling out my front door, “You damn kids!” and shaking my bony fist at them. But I’m neither cranky nor old, and my fist is not particularly bony.) The knocking happened sporadically over the course of several weeks, between about 7 and 7:30 AM. There would be a few knocks or taps, maybe three or four, but then they would stop. I even managed to capture the knocking with a tape recorder placed near the door. It was very strange. The main suspects were pranking school kids gathered across the street at the corner. But none of them seemed to pay attention to me, and they’d have to be very fast runners to get from my doorstep to the bus stop in the ten seconds or so it took me to get to my front door. I thought it might be the house settling, as they often do, with ordinary creaks and taps. But this seemed very regular, and only heard at that time of day. Another option was of course ghosts. Hints and Clues 1) Always note the circumstances of the event. In this case, I did notice that the knocking seemed to get slightly later as the days went on. One day I heard it at 7:15, for example, and a few days later it appeared at 7:30. It might have been a good idea to keep a notebook and watch handy to record the exact times. 2) When interviewing eyewitnesses, it’s often helpful to establish their characterizations of what they saw or heard. For example, two people might hear the same noise, and one of them will describe it as “tapping” while the other might say “knocking” or “snapping,” or even “creaking.” Don’t get hung up on the exact words, since the descriptions of the sounds will be subjective anyway. You might ask the person to recreate the sound with some ordinary objects. In this case, I grilled the eyewitness mercilessly, asking myself, “Okay, Radford. Was it knocking, or could it have been something else?” Under this withering cross-examination, I put down my coffee cup and sheepishly admitted it could be tapping, or a low clicking sound. Solution The solution (which I admit it took me about a week to figure out) is that the “knocking” was created not by a ghost, gremlin, or invisible guest, but instead by the metal front door itself. Since (as you can tell from Figure 1), the house faces east, the sun rises over the mountains each morning. 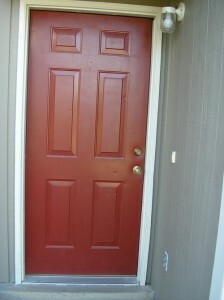 The hot New Mexico sun heats up the outside, which is painted dark red (see Figure 3), and that expands against the much cooler inside panel of the door (Figure 2). The warm outside part of the door expands slightly against the cooler part at the door’s joints and seams, making popping noises. Those pops sound very much like knocks—especially because the door is hollow, and therefore the sounds are amplified throughout the door and across the house. I later confirmed this hypothesis by measuring the temperature difference between the inner and outer sides of the door, and tracing the source of the sound to the edges of the door.